In 21st century, the advent of modern technology and construction makes it possible to achieve a polished glossy look in the stones rough-hewn texture. This is such a great inspiration for contemporary designer. When you use this kind of tile in an interior set, the finishing is what deduces the overall impact of the design. Although the texture is meted out and flattened, the overall outlook of this contemporary stone tile aesthetic is very much co-independent with the modern genre. You can add perspective by choosing either a Glossy finished tile style or a Matt finish tile. Both stand as individual entities that need to be parsed out within the context of a specific interior design scheme. 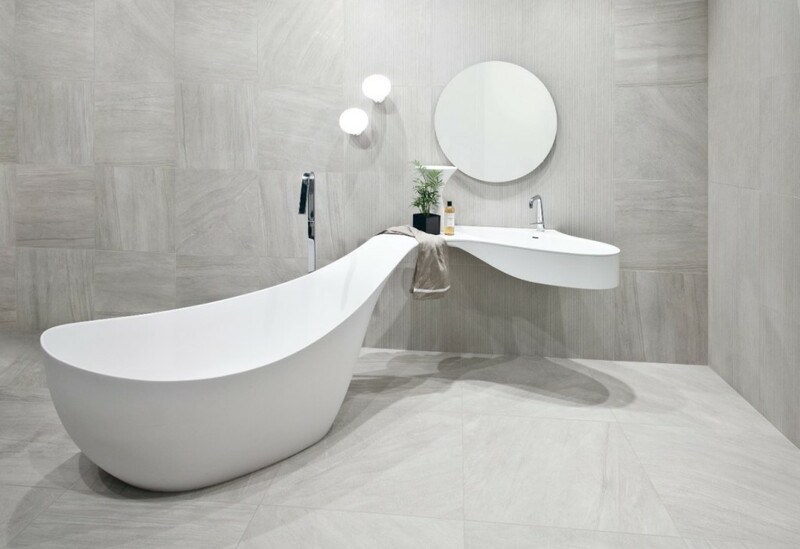 Today, we will be taking a look at a few stone inspired tile designs that give of a natural look with a modern edge. Bathroom tiles as a whole come in mostly light textures, and choosing a stone aesthetic for such kind of a bathroom can lead to a visual discrepancy between the context and aesthetic. But now, you can ditch that discrepancy by choosing Hup Kiong’s natural textured stone inspired tile design. The gloss finish pays deference to the functionality while the relevant stone texture gives effect of the kind of aesthetic the client was vying for to begin with. 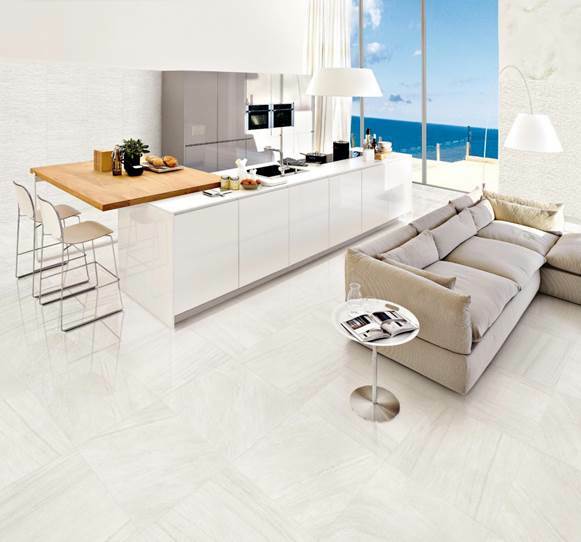 This living room come kitchen boasts a sleek floor design with an organic texture. Though the relevancy to actual stone is muted, the texture is still spot on enough to offer the best of visual effect there is. The combination of this specific floor application with the marbled and chiseled tile effects on the wall create a truly alluring aesthetic. 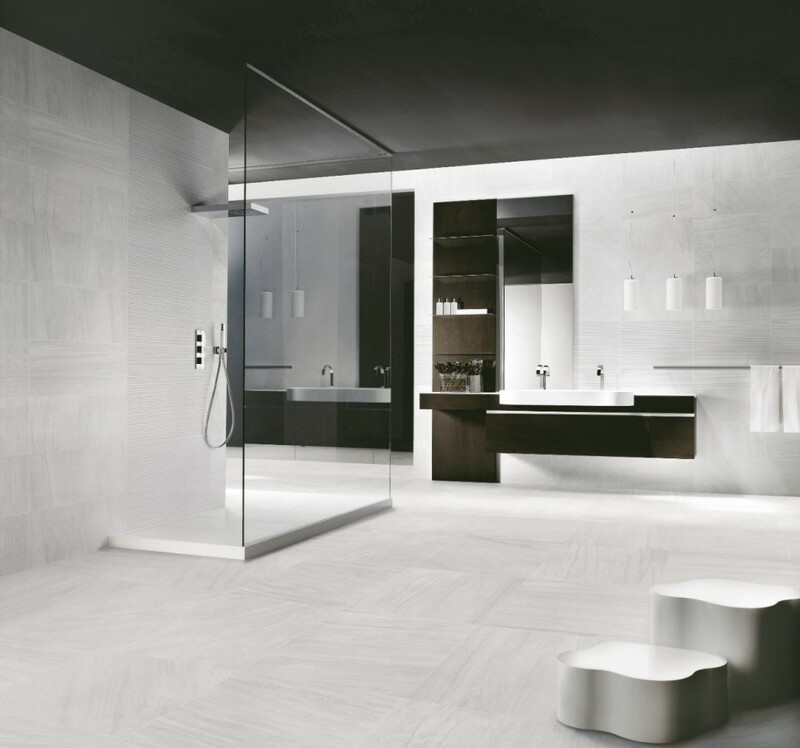 Another instance of a beautiful correlative aesthetic between the floor and feature wall, this tile set gives off a contemporary edge that stays true to its intrinsic style. 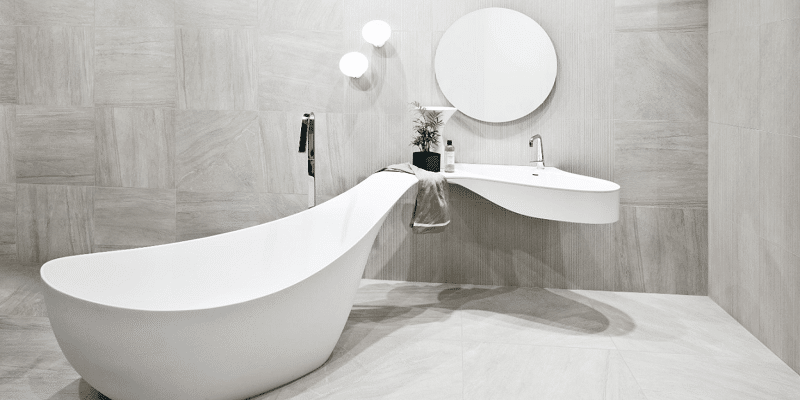 The overall effect is quite mesmerizing and adequately stylistic enough to fit a modern interior bill. 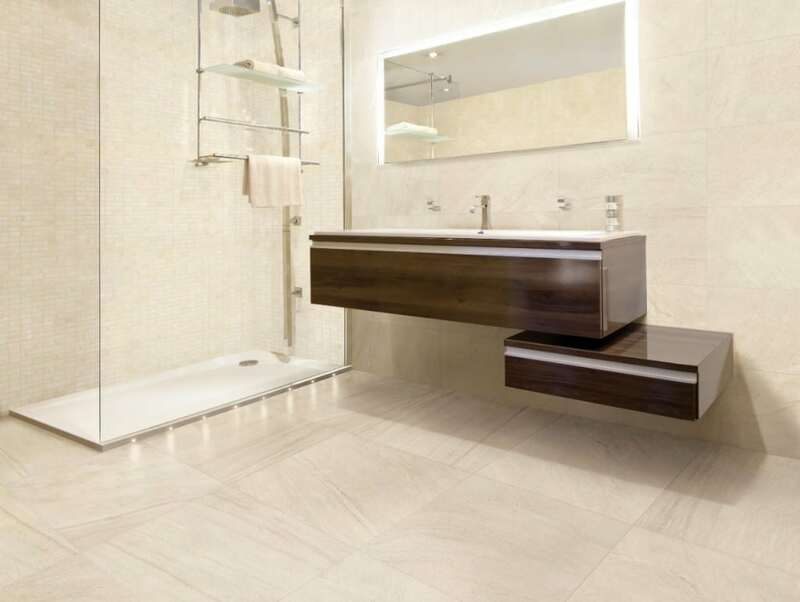 Going Minimal While a glossy finished tile can add a certain panache to an interior setting, there something about the simple, muted elementary design of a matt finished tile that gives of a distinctly sophisticated and chic vibe. The plain sailing combination of glass and stone textured matt finished tiles creates a quiet and unassuming environ. 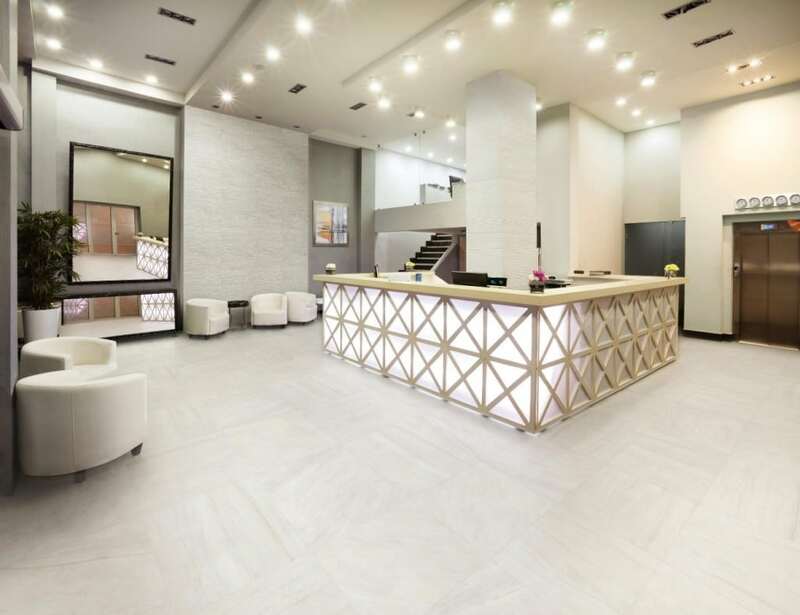 Add a stone effect to the mix and the end result is quite stunning – a modern, minimalistic tile setting that is elegant, straightforward and undemanding while at the same time being manageable with an added bonus of contemporary aesthetics.